Cass from Frugal Family posted a question on Twitter the other day about how she could get her son to show more interest in reading. I tweeted back a couple of ideas, and suddenly thought that it would be great to list all of the ways that I have helped Top Ender and Baby Boy and ask for more suggestions for everyone's future use! Books, books and more books. Top Ender and Baby Boy have more books than a small library and they are all easily accessed. There are some in their bedrooms and the rest are in the living room. They both see Daddy and I reading and we both read to them to. We encourage both Baby Boy and Top Ender to read to us, it might be that they don't use the words in the book but tell us what is happening in the pictures or that they tell us what they remember of the story. The important part is that they are enjoying using a book even if it is just the pictures that they are using. Top Ender really loves the Rainbow Fairy series of books, (they are easy to read and only take as adult 30 minutes to read aloud) and they have sparked her interest in reading because she knows that if she wants to read the stories and I am busy that she will have to do it herself! I have found that finding books on subjects that Top Ender enjoys means the books are read, even when books aren't that easy to read. I have lots of early learners reading books and Top Ender has read them a few times before moving back to her well thumbed and loved books.Of course it doesn't stop me trying to slip in a few books about things that I would like Top Ender to learn like "How to keep your Mum happy" or "How to tidy your room". For Baby Boy I have found that he loves stories about cartoon characters that he has seen or about things that he owns or adores (His favourite book is Whatever Next by Jill Murphy as it combines bears and a rocket). I have brought him several books based on films as that way he already knows the story and I find that he is more willing to read the book. I don't think that it matters that I have memorised the books that I read to Baby Boy or even that I do the voices from films the thing that I am trying to teach as well as how to read is that reading is FUN! When I was little I remember listening to stories that had been recorded for me by Grandparents and Aunties and I had a fine selection of Read along Books (When you hear this sound *Jingle* turn the page). I would listen to the stories at night, reading alone with the book that accompanied the tape (I was born in the 70's we didn't have CD's when I was young!). We have brought several read along books and CD's for Top Ender and Baby Boy and even made our own thanks to the wonder of video editing. 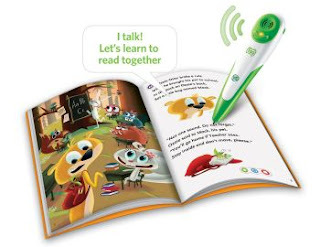 I think this is a great way to help a child to learn independent reading and it has been improved upon with the Leap Frog Tag Reading System. Top Ender was lucky enough to have this brought for her by Granny a couple of years back and Top Ender will often be found reading one of the Tag books by herself only using the pen if she gets stuck on a word. 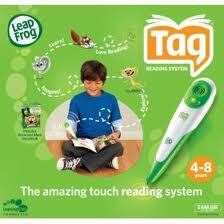 Its a great system and we have a Tag Junior for Baby Boy but he likes someone else to read with him still. I think that all children love to know that we love them and appreciate them and it was because of this that I started writing notes to Top Ender and leaving them in places for her to find. There are the usual lunch notes (which at first were written hieroglyph style), there are notes left under her pillow, slipped under her door, and then the more advanced notes that lead Top Ender on a hunt to find a prize like our Treasure map! I have flashcards, not just ones from shops, but ones that I have made too. I have made ones with numbers on one side and the word on the other, I have made ones with pictures of emotions on one side and the word on the other and then the ones that I have brought or been given over the years. I keep a pack in my handbag, there is a pack in the car and I even have a downloaded version on my ipod touch. This way where ever we are and what ever the time I can whip out something to keep Top Ender and Baby Boy amused and its a bonus that it is a teaching time too! I made clear written index cards for Top Ender in pink pen, (Top Ender thinks that Pink and Purple are the only colours worth writing in) that went all over the house. I don't think there was a surface that didn't have a card stuck to it stating what it was. I figured that if the words were there then Top Ender would learn them just by repeatedly looking at them. I will often put subtitles on when we are watching a DVD or a TV programme, (mostly I do it for me because whilst I am not deaf I find it easier to read and listen to what is going on!) and I have found that Top Ender will often read a word or three this way, it helps with the debates that we have too over what a character just said! It also helps when I put on a Studio Ghibli in the original Japanese as Top Ender might of learnt a song in Japanese but there is no way she is fluent! Some of the first words that Top Ender could read were shop names that she would see as we were out and about in the car. Top Ender was determined that this wasn't reading, that she just knew what these signs said because she was clever. I managed to convince her in the end that recognising a word like this was what reading really was when I wrote down some shop names in my handwriting rather than the logo format that she normally saw and she was able to still read them. This has developed into a game where we have to read names of shops or the words on signs or street names that we go past and again is something to keep us amused as well as a good learning experience! I also use shopping as a learning experience for reading (and maths but that's another blog post) giving the shopping list to Top Ender and asking her to read out what is on the list and then to cross off what we put in the trolley. Of course this doesn't always work if someone on the shop floor is eager to help or if you go shopping on your own without the children! The library is a great place to take children who you want to encourage a love of books in. I could spend hours looking at the different books, selecting which ones I want to read, which ones I want to take home, which ones I think are worth buying, what else is by the same author but it tends to be a very quick affair these days with me trying to keep Top Ender and Baby Boy in the children's section and quickly grabbing a pile of books for myself from the recently returned section. Owning a library card, not only teaches responsibility but also opens the opportunity of new books to read! What other tips do you have for helping a child learn not only to read, but to love to read? Leave me a comment and let me know what it is!